The human brain is organized of highly complex and expansive cellular and neuronal networks, but the existing scientific understanding of the developing brain is proportionately limited. Neuroengineering is an evolving field that employs advanced technology to manipulate neurons. The discipline can develop disease models of the central and peripheral nervous system to grasp neurological disorders, and produce next-generation biomaterials for neural tissue engineering. The ability to directly reprogram and convert mature cells such as fibroblasts (somatic cells) into neurons has also presented promising therapeutic potential. Technology for neuroengineering aims to design and create a broad range of applications to regulate neurons. Neuroscientists have recently shown that brain extracellular matrix (BEM) decellularized from human brain tissue can simplify the conversion of primary mouse embryonic fibroblasts directly into induced neuronal (iN) cells in the lab. The iN cells generated on BEM substrates were transplanted in the brain of an animal model of ischemic stroke, leading to significant improvements in locomotive behaviors. The study also showed that combining 3-D BEM hydrogels with microfluidics could recreate brain-like microenvironments with higher efficacy to boost direct reprogramming and neuronal conversion, to promote functional recovery of animals after cell transplantation. The research is published in Nature Biomedical Engineering. 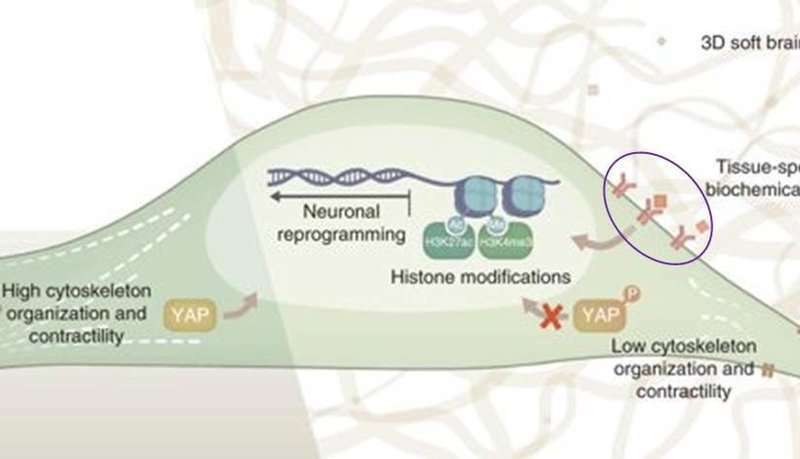 During neuronal reprogramming, the engineered 3-D system is believed to stimulate Yes-associated protein (YAP) and histone modifications for mechanosensitive signaling. 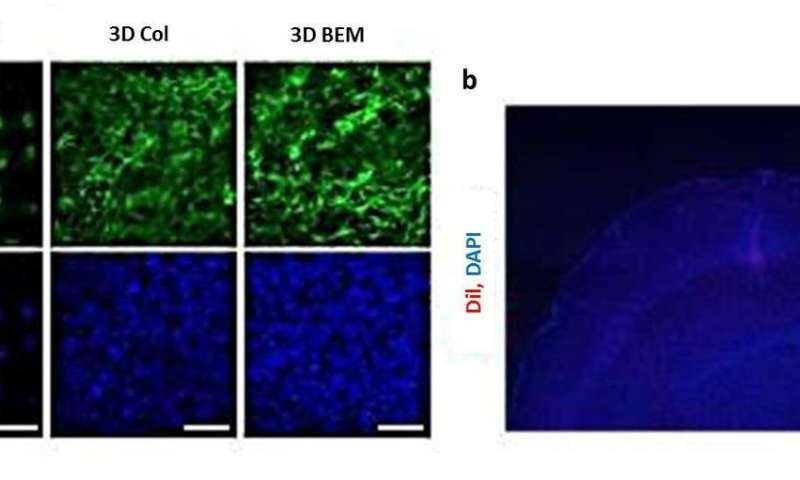 The 3-D BEM hydrogel may also provide microenvironmental memory to retain functional phenotypes of the induced neuronal (iN) cells acquired during the conversion process. In the study, Seung-Woo Cho and co-workers first extracted brain extracellular matrix (ECM) from donor-human brain tissue to create a solubilized mixture of brain-specific native components. The solution was then used to develop and test 2-D surface coatings or 3-D systems to culture fibroblasts undergoing direct neuronal programming in the lab. The illustrated neuroengineering procedure: decellularization of native brain tissue to produce solubilized brain extracellular matrix (BEM) to create 2D and 3D BEM platforms to reprogram fibroblasts into functional neurons. Credit: Nature Biomedical Engineering, doi: 10.1038/s41551-018-0260-8. Direct conversion of mature somatic cells into different cell types, as seen in this instance with fibroblasts to neurons, in the presence of tissue-specific transcription factors, is known as trans-differentiation. In contrast to typical viral delivery systems, plasmids were used as the biomedical delivery vehicle of choice to transfect neuron tissue-specific elements, including BAM factors, via electroporation into the fibroblasts for induced neuronal transdifferentiation. The study showed that BEM significantly accelerated direct neuronal reprogramming, since induced neurons showed electrophysiological functions and mature neuronal marker expression as early as 14 days under laboratory conditions of cell differentiation. Immunocytochemistry and genetic analyses showed improved growth and differentiation with BEM compared to conventional biomaterials such as laminin and fibronectin, often used to fabricate 2-D extracellular matrix (ECM) coatings. Immunocytochemistry results: by day 14, the population of iN cells that stained positive for both neuron specific class III tubulin (Tuj1) and highly mature neuronal phenotype markers synapsin I (SYN1) or post synaptic density protein 95 (PSD-95) was greater in the 0.01 mg/ml BEM group than in the laminin group (LN) or in the laminin-fibronectin (LN+FN) group. DAPI (blue) stains nuclei. The region within the white box is magnified and displayed in the yellow square. BEM enhanced the direct neuronal conversion of primary fibroblasts to generate iN cells at an optimal concentration of 0.01 mg/ml. Credit: Nature Biomedical Engineering, doi: 10.1038/s41551-018-0260-8. After completing extensive gene expression profiles and electrophysiological tests to characterize iN cells in the lab, scientists transplanted BEM-based iN cells into an adult mouse model of ischemic stroke exhibiting hypoxic brain injury to observe their therapeutic potential. In addition to neurogenesis, the paracrine effects of iN cell transplantation restored motor coordination and locomotor movement in the mice, demonstrating therapeutic efficacy. Interestingly, cells cultured on 3-D BEM hydrogels showed higher expression levels of neuronal markers compared to 2-D BEM, indicating that biomimetic brain-like microenvironments can provide optimal biochemical and biophysical cues to guide cell reprogramming. Researchers then ingeniously combined 3-D BEM hydrogels with a microfluidic system (3-D µBEM), to amplify the autocrine and paracrine signaling of iN cells in a confined microenvironment and boost neuronal transdifferentiation. Immunostaining analysis of iN cell cultures in multiple 3D materials, comparing conventional collagen (Col) and Matrigel (Mat) with 3D BEM, the expression of neuronal markers (Tuj1 and microtubule associated protein-2 MAP2) was significantly increased in the 3D BEM group. Credit: Nature Biomedical Engineering, doi: 10.1038/s41551-018-0260-8. When such iN cells reprogrammed within brain-like 3-D µBEM environments were collected and transplanted in an ischemic stroke mouse model, functional recovery and therapeutic efficacy were noted. To illuminate the underlying the molecular mechanisms, scientists proposed that biophysical cues in a 3-D brain-like microenvironment may specifically induce YAP (Yes-associated protein) localization to the cellular cytoplasm to promote neuronal transdifferentiation. 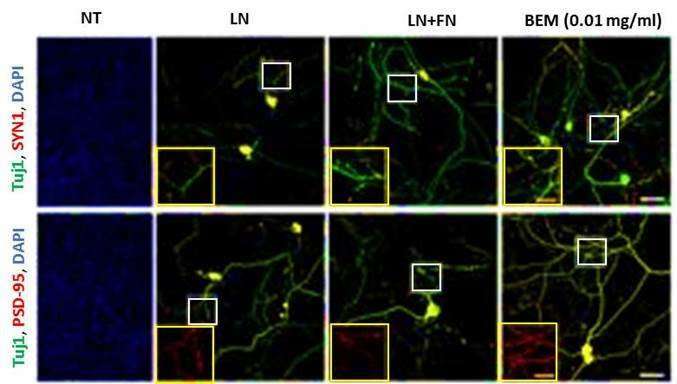 In contrast, stiff 2-D environments induced nuclear YAP localization, repressing neurogenesis-related gene expression, as observed in the study. Understanding the molecular mechanisms of direct neural reprogramming for implantation in an animal model of ischemic stroke: a) immunostaining YAP (green) to quantify YAP localization in 2D and 3D conditions, b) tracking Dil-labelled (red, long-term tracer of neurons) iN cells generated from 3D µBEM at day 7 after cell injection in the striatum and cortex within the ischemic brain of an animal model. Credit: Nature Biomedical Engineering, doi: 10.1038/s41551-018-0260-8. The study sheds light on the molecular mechanisms underlying direct neurogenesis, together with strategies to design and develop optimized biomaterials for improved neural reprogramming, reproducible in the lab. Brain-like 3-D biomimetic microenvironments can provide biochemical, biophysical, mechanical and epigenetic stimuli to efficiently reprogram neurons. Key insights from the study can be translated in the future to design and engineer a synthetic brain-like matrix to generate safe iN cells for regenerative and medical applications in neuroengineering. More information: Three-dimensional brain-like microenvironments facilitate the direct reprogramming of fibroblasts into therapeutic neurons www.nature.com/articles/s41551-018-0260-8 Jin et al, 11 July 2018, Nature Biomedical Engineering. Liver extracellular matrix providing dual functions of two-dimensional substrate coating and three-dimensional injectable hydrogel platform for liver tissue engineering pubs.acs.org/doi/10.1021/bm4015039 Lee et al, 2014, Biomacromolecules. Heart repair by reprogramming non-myocytes with cardiac transcription factors www.ncbi.nlm.nih.gov/pmc/articles/PMC3367390/ Song et al, 2012, Nature. In vivo reprogramming of murine cardiac fibroblasts into induced cardiomyocytes www.ncbi.nlm.nih.gov/pmc/articles/PMC3369107/ Qian et al, 2012, Nature. High-efficiency cellular reprogramming with microfluidics www.nature.com/articles/nmeth.3832 Luni et al, 2016, Nature Methods. Biophysical regulation of epigenetic state and cell reprogramming www.nature.com/articles/nmat3777 Downing et al, 2013, Nature Materials. 3-D niche microarrays for systems-level analyses of cell fate www.nature.com/articles/ncomms5324 Ranga et al, 2014, Nature Communications. Substratum-induced differentiation of human pluripotent stem cells reveals the coactivator YAP is a potent regulator of neuronal specification www.pnas.org/content/111/38/13805 Musah et al, 2014, Proceedings of the National Academy of Sciences.